Mary Lee, the 16-foot, 3,500-pound great white shark is spending some quality time off the South Jersey coast. And why not on a holiday weekend? She last pinged about 6:30 Sunday night, just about due east of Cape May Point. Mary Lee is known to spend lots of time off the New Jersey coast. RELATED: Jersey Shore towns named best summer vacation destinations in U.S.
As Hooper, the researcher in the movie "Jaws" told Mayor Vaughn, she's a carcharodon carcharias. The shark's movements have been followed with a GPS tracking device by the nonprofit research organization OCEARCH since September 2012. 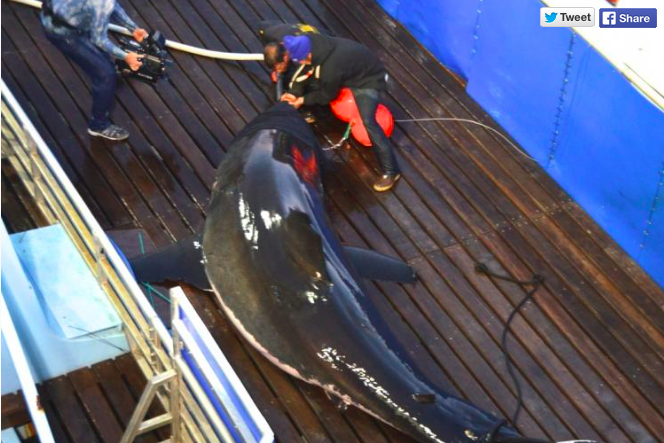 Each time Mary Lee’s dorsal fin surfaces, a ping is emitted and recorded on a tracker. A Twitter account with the handle @MaryLeeShark has amassed more than 100,000 followers and retweets posts about the great white's latest whereabouts.